Whether you use earbuds or over-ear headphones, they can be tricky to store since the wires can easily get tangled. 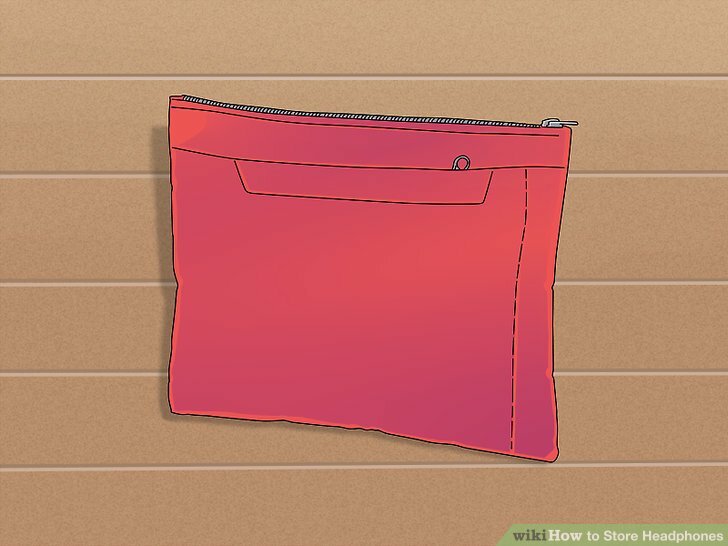 If you want to clear some clutter or travel with your headphones, you can use some simple solutions for storing them. By wrapping the cord to prevent tangles as well as using storage cases, you won’t have to deal with tangled headphones again! Hold the cord between your thumb and forefinger so the plug faces your body. Start by holding the cord with your non-dominant so your palm faces up. Pinch the thick plastic around the auxiliary jack so the metal end points towards your body. Run the cord behind your hand so it hangs down. If you have over-ear headphones, check if you can unplug the cord from the earpieces. This will make it easier to wrap. Loop a length of the cord around your fingers. 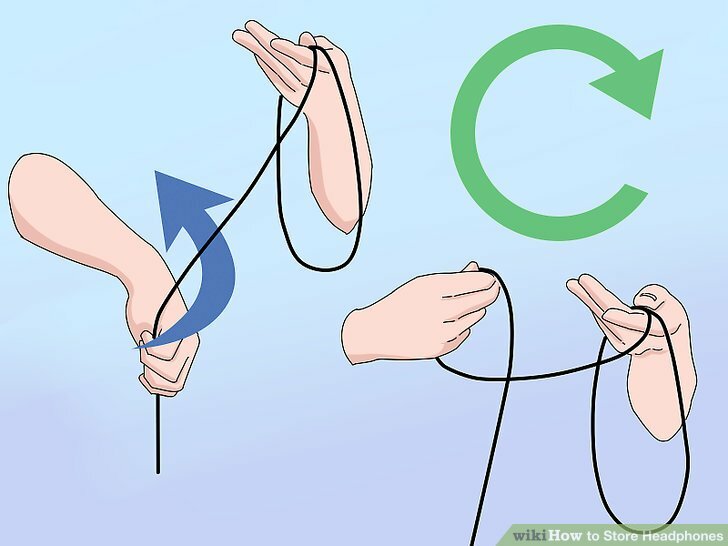 Grab a part of the cord hanging down with your dominant hand and wrap it around your non-dominant hand. Don’t wrap the cord tightly or you else you could strain the wires inside the cord. Hold the top of the loop with your forefinger and thumb next to the jack. Aim to have your loops look like perfect circles. 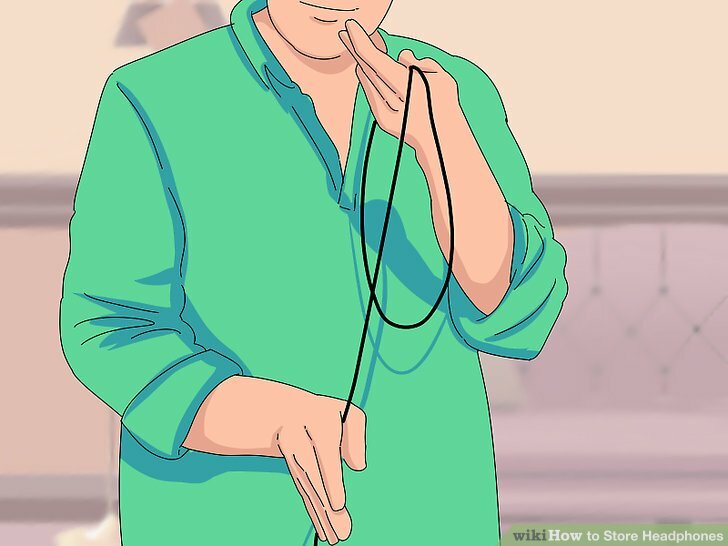 Grab a length cord with your palm facing away from your body. 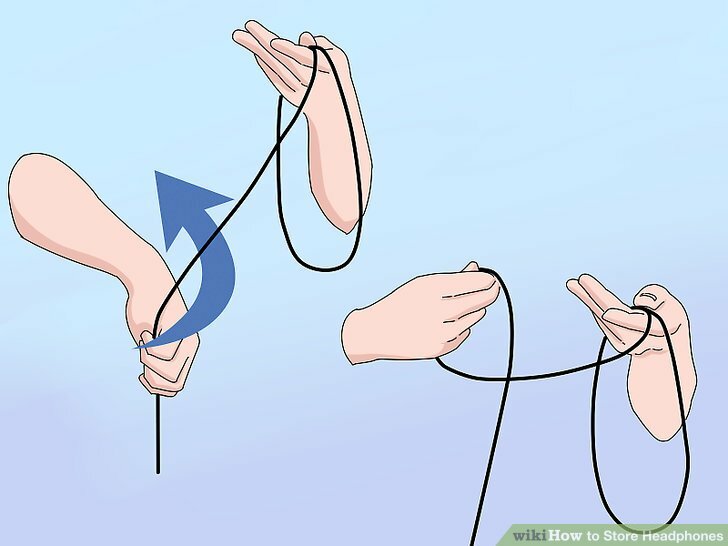 Twist your dominant hand as if you were giving an upside-down handshake and grab the cord. Use the same amount of cord as you used with your first loop. Pull the cord up to the top of the loop. As you lift the cord, twist your wrist back towards your body so the cord forms a loop. Tightly pinch the top of the loop next to the other loop wrapped around your non-dominant hand. This known as the over-under wrapping method and is used to prevent cords and cables from twisting. Repeat the over-under technique until the cord is wrapped. Alternate between regular loops and the upside-down loop for the entire length of the cord. The cord won’t bunch up or twist, allowing it to easily unfurl when you’re ready to use them again. If you wrap your headphones without using the over-under technique, the wires inside will twist and kink. This could damage your headphones after you repeatedly wrap them. Hold the cord together with a twist tie. 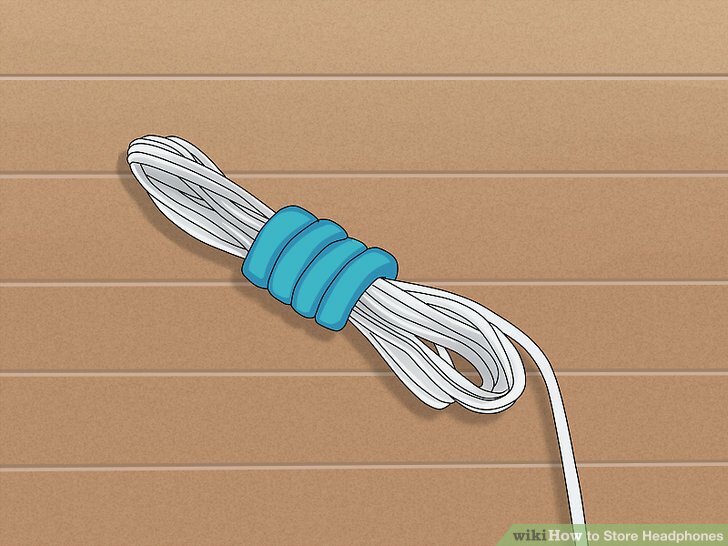 Wrap a twist tie around the loose ends of the cord to secure them to the rest of the loops. 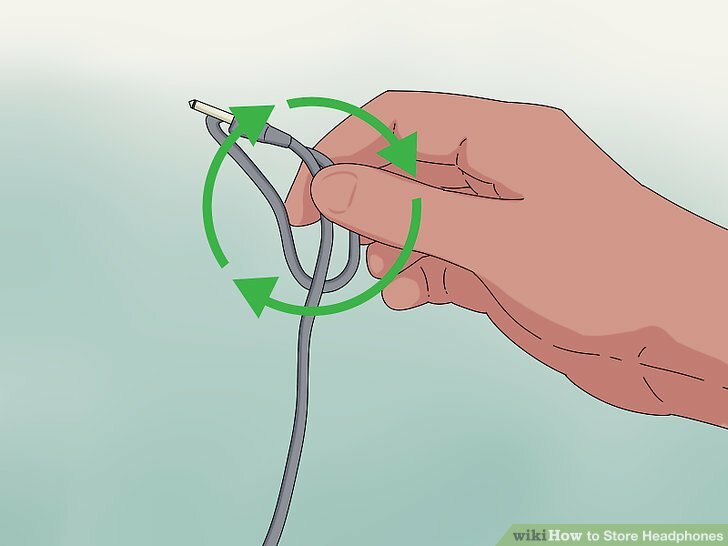 Spin the ends of the twist tie to hold it in place. Use second twist tie if you want extra security. Use the case your headphones came in if you still have it. Most earbuds or headphones come with a carrying case or bag to make it easier to transport them. Look at the original packaging to see if there are specific slots for the cord and headphones. Not only do most headphones come with a carrying case, but they also come with replacement pieces in case you lose parts. Buy a pouch or carrying case if you travel with your headphones frequently. Instead of throwing your loose headphones in a backpack, get a dedicated case for your style of headphones. 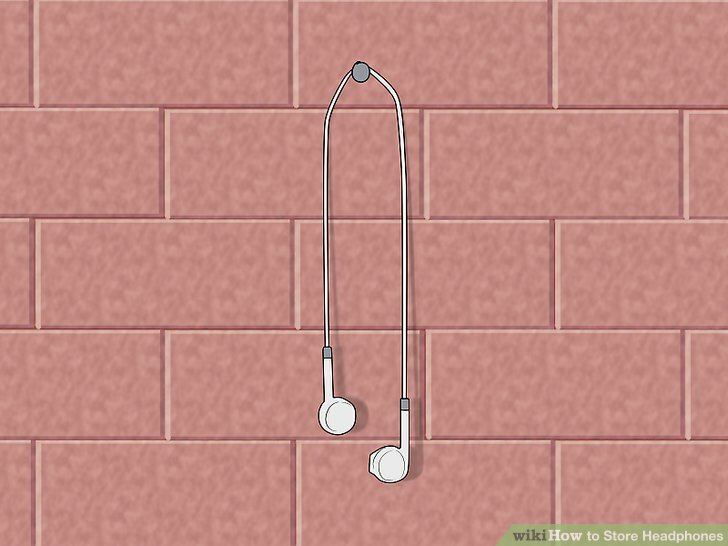 Always put your headphones and any cords in the case so you don’t lose them or get them tangled with other things. Carrying cases can be found either online or in your local electronics store. Keep over-ear headphones on a stand if you use them often. Find an elevated stand that is thick enough to support the headband. Set the stand on your desk or where you frequently use your headphones. Wrap the cord using the over-under technique and set it on the stand’s base so it’s out of the way. You don’t need a stand if you’re using earbuds. Turn a mint container into a portable carrying case for earbuds. 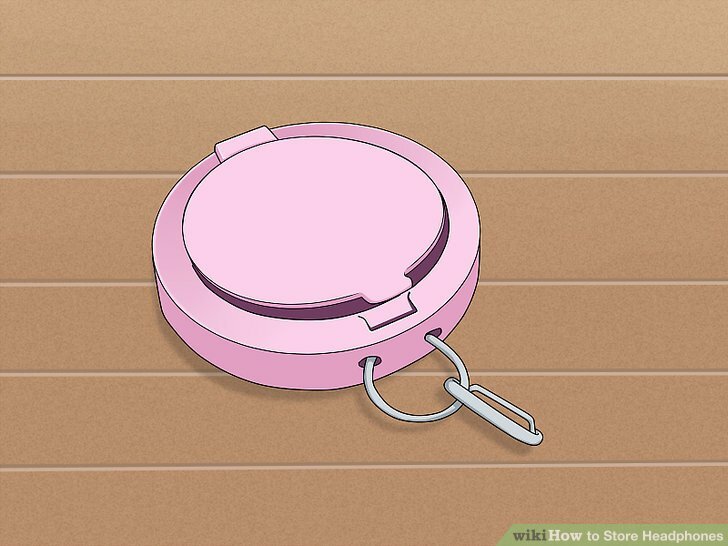 Use either a circular or rectangular mint container a small case. 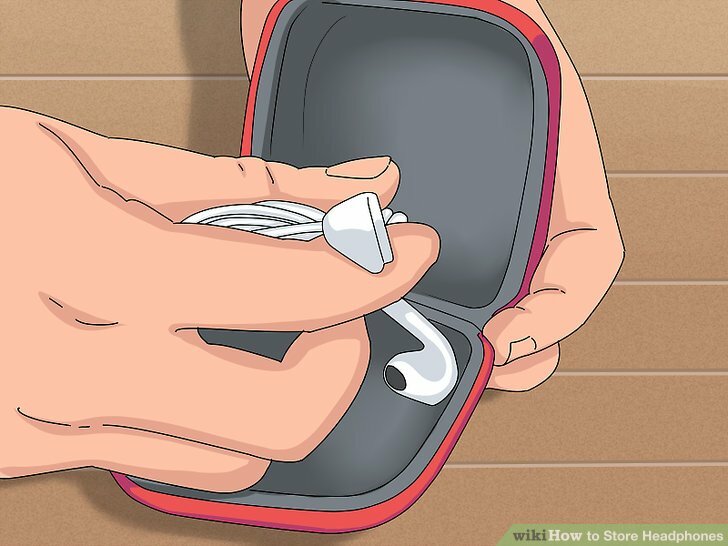 Wrap your earbuds in a tight circle using the over-under method and place them inside the container. 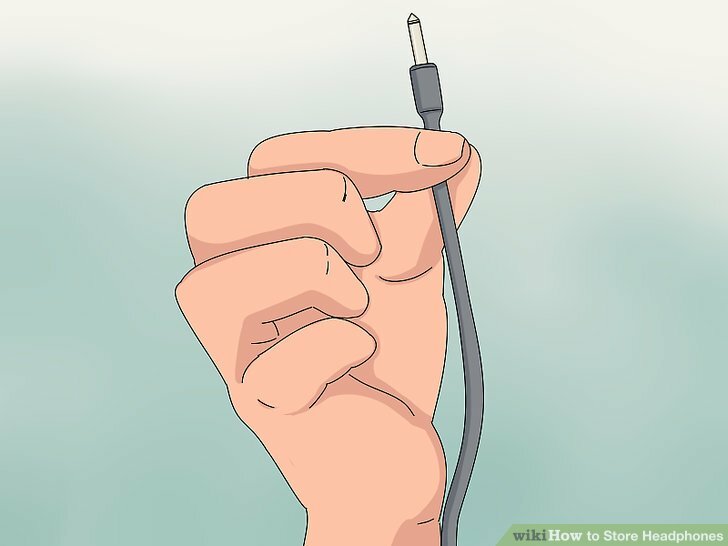 When you need to use the earbuds again, simply pull them out of the container. You can use either a plastic or metal mint container. Decorate the container with paint or stickers to add personal flair. Hang earbuds from a thumbtack if you keep them at home. Push 1 or 2 thumbtacks into a bulletin board and d**** your headphones across them. This way, you can easily access them and keep them off your tabletops. Make sure not to stab through the headphones with thumbtacks. This works best for lightweight earbuds rather than over-ear headphones. Create a makeshift stand with 2 binder clips to hang your over-ear headphones. 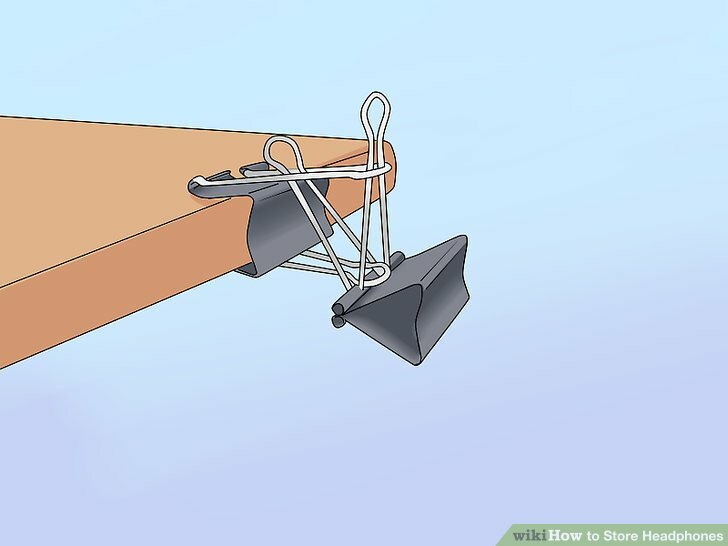 Fasten one of the binder clips to the side of your desk or table so the silver arms face out. Feed one of the arms on the second clip through the top arm of the clip on your desk. Place the bottom arm of the first clip through the arms of the second clip. Adjust the black part of the second clip so the bottom is perpendicular to the floor. Hang your headphones from the clip so they’re easy to access. Binder clips can be purchased at your local office supply store. 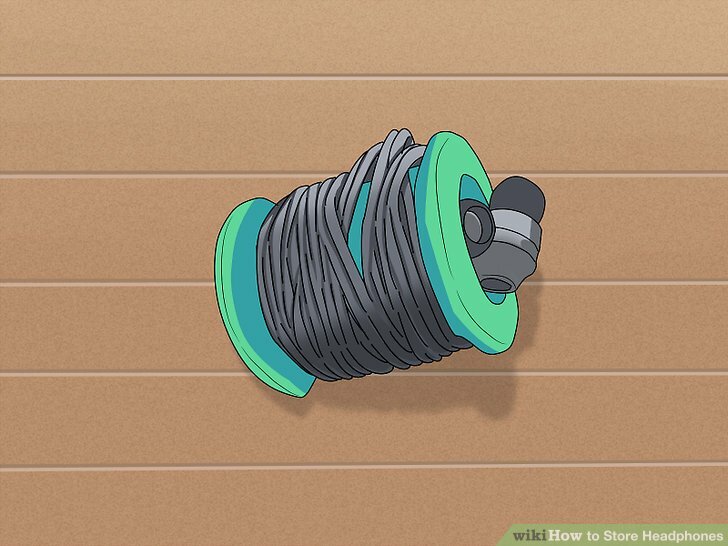 Wrap your earbuds around a sewing spool to keep them compact. Feed the headphone jack through the hole in the center of the spool and pull the cord through. The earbuds will be too big to go through the middle and hold the headphones in place. Loosely wind the rest of the cord around the spool, and tuck the jack back into the hole or underneath some of the cord. Empty spools can be purchased at fabric or craft stores. Avoid wrapping your headphones around your device, since this could kink and damage them. 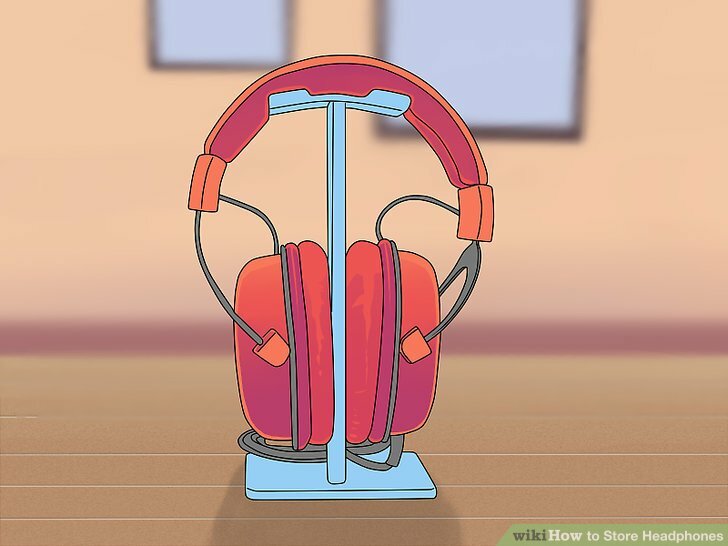 If you’re storing noise-canceling headphones for an extended period of time without using them, remove the batteries so they don’t leak and ruin your headphones.